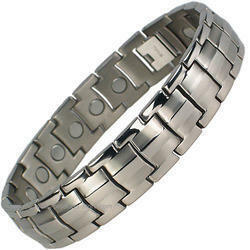 Providing you the best range of titanium magnetic bracelet for bio magnetic therapy with effective & timely delivery. We have gained vast industry experience of manufacturing, supplying, and exporting a huge gamut of authentic Bio Magnetic Bracelets for Magnetic Therapy including Titanium Magnetic Bracelet for Boi Magnetic Therapy. It is designed to offer multiple health benefits due to its outstanding healing power and immunity enhancing properties. These have been demonstrated to control blood pressure, correct immunity status, and so forth. It also relieves backache, arthritis, headache, and improves respiratory functions to rejuvenate body metabolism. It is manufactured under rigid norms of quality norms in adherence with global norms and can be availed at industry leading prices by our esteemed customers. Looking for Titanium Magnetic Bracelet for Bio Magnetic Therapy ?